Heat Demon by Symtec - External handlebar warmer kit with Hi/Lo switch. Extend your riding season with the external motorcycle hand warmers. This kit allow the heating elements to be fitted neatly and discreetly under the original or aftermarket grips. Easy to install, with two-stage heat setting, this kit is suitable for all types of motorsports using a twist grip throttle. Kit includes 2 heaters, Hi/Lo round rocker switch or metal toggle switch, hardware, plastic tie strips and instructions. Totals 40 watts and draws around 3 amps. 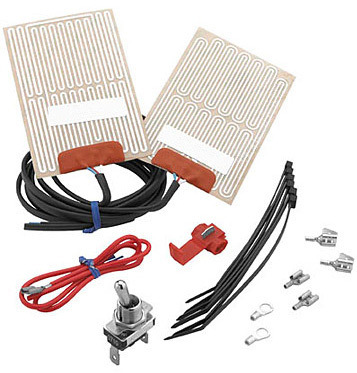 Kit includes 2 heaters, Hi/Lo metal toggle switch, hardware, plastic tie strips and instructions. Kit includes 2 heaters, Hi/Lo round rocker switch, hardware, plastic tie strips and instructions. Kit includes everything needed for fast, easy installation. No drilling required. Extend your riding season with the external motorcycle handlebar warmer kit. This kit allow the heating elements to be fitted neatly and discreetly under the original or aftermarket grips. Easy to install, with two-stage heat setting, this kit is suitable for all types of motorsports using a twist grip throttle. Kit includes 2 heaters, Hi/Lo round rocker switch or metal toggle switch, hardware, plastic tie strips and instructions. Totals 40 watts and draws around 3 amps. 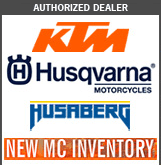 Convenient and safe heat extends your riding season. Independently control grips and seat warmer (seat warmer sold separately). Quad Zone controller has 2 auxiliary parts tht can be used for Heat Demon vest, additional seat warmers and all other heated items using a 2.5mm DC plug. 70 watts each. L.E.D. lights indicate heat level and automatically dim for night riding. Totals 40 watts and draws less than 3 amps. Works with virtually any motorcycle that utilizes a battery.